While New Year sales are front of mind long before promoting next year’s summer holiday plans, if you don’t want those warm weather OOH advertising opportunities to pass you by – now is the time to start booking. ‘Dreaming of that summer holiday?’ ‘Don’t wish you were here – be here!’. You don’t have to stoop to the obvious to target your customers planning a summer break. Whether you’re selling the cheapest plane tickets around, or the luxury escape someone’s dreaming of – local OOH advertising provides the perfect place to promote your goods. The place is the point here. Location-based OOH advertising should be as much a part of your marketing strategy as ‘Google My Business’, and you don’t have to worry about IP addresses. Think back to the last time you spotted a billboard that sparked your interest, was it the artwork, the message or the location that got your attention? While a great campaign is one part of OOH advertising, focussing on WHERE your audience is, is even better. Bubble Outdoor can help you find over 80,000 national ad spaces, including billboards, bus shelters, digital OOH and more, so that you can book ads in locations where you can grab your ideal customers attention. Targeting your ‘California Dreaming’ customer can be as effective as you want it to be. There’s no lack of opportunities for location-based advertising. Bubble’s huge network of ad spaces are available to savvy marketers who know what locations are frequented by their ideal customers. If you’re not quite sure – Bubble has a handy guide to targeting your persona. When you plan ahead, there’s no limit to the way you can use location-based marketing with OOH. You might remember Great Western Railway’s ‘Five go on an adventure’ campaign – this integrated campaign used above the line and below the line marketing strategies, but most notably used OOH advertising in a clever way by targeting station billboard locations. 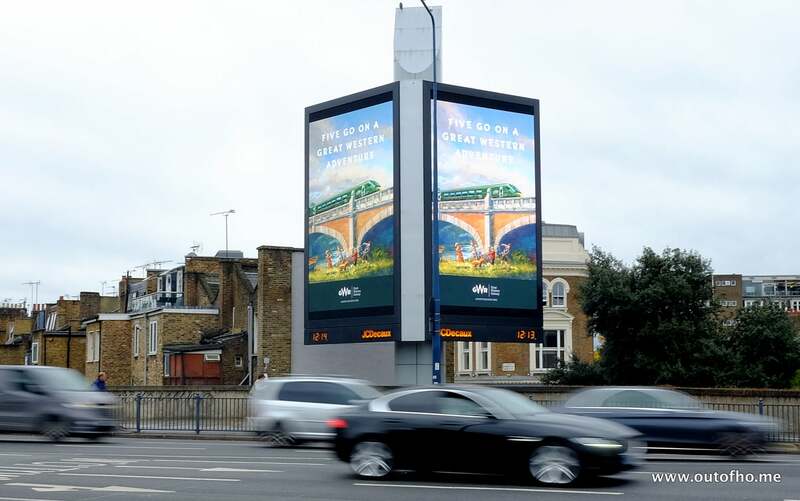 The Great Western Railway campaign not only demonstrates how OOH can be used effectively with other marketing platforms, but also how you can change the perception of a brand. As the agency behind the campaign said, by reimagining Britain’s much-loved characters the campaign parallels the excitement and spirit of adventure between the Famous Five and Great Western Railway. Mytaxi’s ‘Helping London Move More Freely’ was a significant campaign that drove brand reputation using OOH. The entire campaign hung on the location of the ads – utilising popular commuter paths to promote the brand was the niche of the campaign. As referenced in this study ‘Media in Focus – Marketing effectiveness in the digital era’ from authors, Les Binet and Peter Field – a 60:40 ratio of investment in reach (brand-led) and activation (short-term sales booster) returns the biggest number of large business and brand effects. Imagine how the same technique could be used to capture the attention of tired, cold commuters dreaming of warmer climes? While digital marketing is still a great ‘bang for buck’ scenario – growing brand recognition, trust and targeting customers in the consideration or discovery phase of their journey can mean you need to jump out from behind the screen. OOH can give a huge boost to the way your brand is perceived, either by the way you catch customers off guard while going about their day or by utilising creative avenues to make your brand stick. Bubble can even help you make sure that once you narrow down the location of your customers, you capture their attention in an instant- check out the guide to ad design. If you’re ready to target your customers, check out the Bubble Outdoor OOH advertising options now. How to book outdoor advertising with Bubble What is Outdoor Advertising?